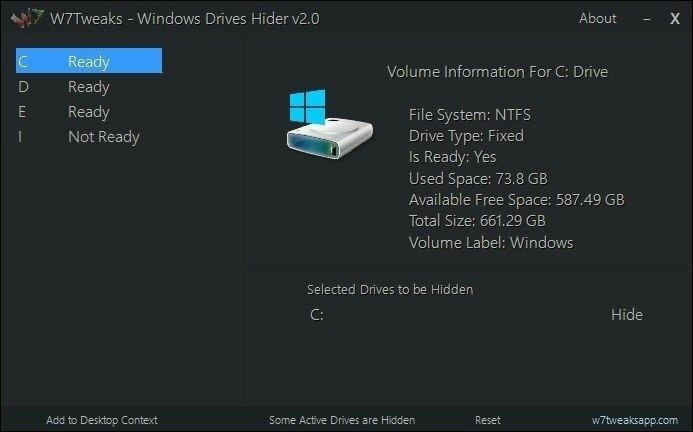 Windows Drive Hider helps to hide the active or visible drives showing up in 'My Computer', File Explorer or File Open/Save Dialog boxes with a single click. Since the application reads and write to Windows Registry, Antivirus might show application is suspicious threat. Application can be added to windows desktop context menu for easy access from the desktop. Windows Drive Hider using Windows resource imageres.dll for the context menu icon, and it can hide single drive or Multiple Drives at once. The program is tiny and portable yet powerful to get the job done. You will be able to get the contents of hidden drive through run command or command prompt or by typing the path directly in the Windows File Explorer address bar. This is an ideal solution for administrators and parents to safeguard sensitive files from their children, thus it makes easy for you to quickly show or hide any Drive with just a click. Softpedia guarantees that W7Tweaks - Simple Windows Drive Hider is 100% Clean.